Dr Amritpal Mudher is Associate Professor in Neurosciences within Biological Sciences at the University of Southampton. 2014-present: Associate Professor in Neuroscience. University of Southampton, UK. 2004-2014: Lecturer in Neurosciences. University of Southampton, UK. 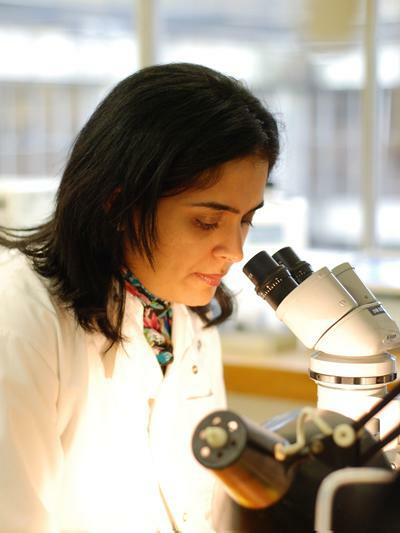 2001-2004: Alzheimer Society Research Fellow (Modelling Tauopathies in Drosophila). Institute of Psychiatry, University of London, UK. 1998-2001: Post Doctoral Research Worker (Wnt signalling and Alzheimer's Disease). Institute of Psychiatry, University of London, UK. 1995-1998: DPhil (Neuroscience). Merton College, University of Oxford, UK. 1992-1995: BSc (Biomedical Sciences). King's College, University of London, UK. The overarching aim our research is to investigate the mechanisms that underpin tau-mediated dysfunction and degeneration in tauopathies such as Alzheimer’s disease and fronto-temporal dementia (see Mudher et al 2004, Mol Psychiatry, Chee et al 2005 for early investigations). This work led us to identify disease-modifying tau-centred therapeutic targets (See Quriase et al 2013 Mol. Psychiatry). It has also raised interesting questions about the pathological significance of established tau aggregates such as soluble forms of tau, tau oligomers and tau filaments. More recently we are assessing whether tau-mediated axonal degeneration is wallerian in nature. A related project investigates the cross talk between tau and other disease-associated proteins such as Abeta peptide and alpha-synuclein. Using transgenic models in which tau is co-expressed with these proteins, we investigate the effect of co-expression on established tau phenotypes and then assess the molecular mechanism(s) underpinning this. Another branch of research focuses on understanding how cellular processes such as TOR signalling, autophagic/proteosomal clearance, oxidative stress and others change with age. In parallel we seek to investigate how these changes contribute to development of Alzhiemer’s disease by studying their interaction with both tau and amyloid pathologies and phenotypes. We are also interested in using label-free Raman spectroscopic techniques to identify aggregated tau and amyloid proteins. By generating unique spectral signatures for various disease associated forms of these proteins, we hope to use this technology to probe biological fluids for biomarkers of early disease. a) Understanding the mechanisms underpinning tau mediated neuronal dysfunction and degeneration in tauopathies such as Alzheimer’s disease (Granular tau oligomer project/Dr. Catherine Cowan and Wallerian degeneration in tauopathies project/Katy Stubbs in collaboration with Prof. VH Perry). b) Identifying disease-modifying tau-centred therapeutic targets (NAP project/Dr. Shmma Quraishe – see Quraishe et al Mol. Psychiatry 2013). d) Understanding the mechanisms by which aging processes contribute to neurodegenerative diseases like Alzheimer’s disease (Aging project/Megan Sealey in collaboration with Dr. Delphine Boche and Prof. Chris Proud). Developing novel Drosophila models of asthma to investigate role played by genome wide association loci (pilot project in collaboration with Prof. Donna Davies, Dr. Jane Collins, Dr. Hans M Haitchi and Prof. Thomas Roeder). Using Drosophila models to replace, augment and inform vertebrate asthma models by allowing first-pass elucidation of key asthma genes, and providing an in vivo model for rapid high through-put drug screening. Microtubule destabilisation is believed to be a key mechanism by which phosphorylated tau causes dysfunction in tauopathies. In Alzheimer’s disease Abeta peptide toxicity is mediated by phosphorylated tau. This PhD project investigates whether microtubule destabilisation underpins this tau-Abeta interaction. Spectral signatures for disease-associated protein aggregates. Molecular chaperones such as heat shock proteins (HSPs) regulate protein folding, misfolding, protein degradation and signalling pathways involved in neuronal death and survival. Knowing exactly how the nervous system degenerates and becomes more vulnerable with age would further our understanding of how ageing occurs and how to prevent the debilitating neurological effects of ageing. Does Wlds mediate protection in a Drosophila model of tauopathies? Can Wlds protect against axonal dysfunction and degeneration in a transgenic model of Alzheimer’s disease? Sealey, M. A., Vourkou, E., COWAN, C., Bossing, T., Quraishe, S., Grammenoudi, S., ... Mudher, A. (2017). Distinct phenotypes of three-repeat and four-repeat human tau in a transgenic model of tauopathy. Neurobiology of Disease, 105, 74-83. Sinadinos, C., Quraishe, S., Sealey, M., Samson, P. B., Mudher, A., & Wyttenbach, A. (2013). Low endogenous and chemical induced heat shock protein induction in a 0N3Rtau-expressing drosophila larval model of Alzheimer's Disease. Journal of Alzheimer's Disease, 33(4). Mudher, A., Folwell, J., Shepherd, D., & Newman, T. (2006). Consequences of co-expression of human tau and Abeta in Drosophila. Comparative Biochemistry and Physiology. Part A: Molecular & Integrative Physiology, 143(4, supplement 1), S113-S114. Shepherd, D., Newman, T., Chee, F., Cuttle, M., & Mudher, A. (2006). Modelling human neurodegenerative diseases in Drosophila. Comparative Biochemistry and Physiology. Part A: Molecular & Integrative Physiology, 143(4, Suplement 1), p.S113. Chee, F., Mudher, A., Newman, T. A., Cuttle, M., Lovestone, S., & Shepherd, D. (2006). Overexpression of tau results in defective synaptic transmission in Drosophila neuromuscular junctions. Biochemical Society Transactions, 34(1), 88-90. Mudher, A., Chapman, S., Richardson, J., Asuni, A., Gibb, G., Pollard, C., ... Lovestone, S. (2001). Dishevelled regulates the metabolism of amyloid precursor protein via protein kinase C/Mitogen-activated protein kinase and c-Jun terminal kinase. Journal of Neuroscience, 21(14), 4987-4995. Mudher, A., & Newman, T. (Eds.) (2007). Drosphile: A toolbox for the study of neurodegenerative disease. (Society for Experimental Biology; Vol. 60). London, GB: Taylor and Francis. Quraishe, S., Mudher, A., & Cowan, C. (2017). Neuroprotection in Alzheimer's Disease: tau-centric therapies for Treating Alzheimer’s Disease . In I. Gozes (Ed. ), Neuroprotection in Alzheimer's Disease (1 ed., pp. 73). Elsevier. Mudher, A., Newman, T. A., Chee, F. C., & Shepherd, D. S. (2007). Using Drosophila models to unravel pathogenic mechanisms that underlie neurodegeneration in Tauopathies. In A. Mudher, & T. A. Newman (Eds. ), Drosophila: A Toolbox for the Study of Neurodegenerative Disease England, GB.